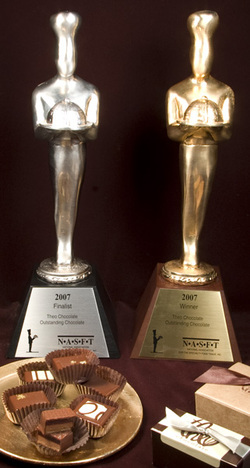 Theo Wins 5 Awards at Academy of Chocolate This Year! This is so exciting for the whole team, striving so hard for organic, fair trade perfection! This far surpasses last year's showing of 2 silvers and a bronze, and really shows our growth and commitment to surpassing our own expectations. 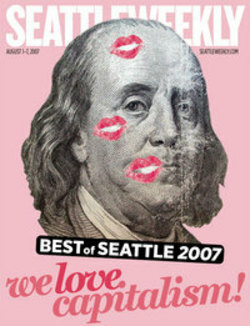 "As Fun As A Bar Is To Drunk People" Theo wins Seattle Weekly Best of! Best Real-world Approximation Of Charlie And The Chocolate Factory: - Best of Seattle ® - 2007 - (Seattle Weekly). Big Thanks for the Seattle Weekly Love! We are honored, and drunk... on chocolate! Theonistas por Vida! Eco-Friendly Theo Chocolate Garners New Accolades! Jeff Deasy gives our CEO Joe Whinney some love on the American Feast Food Blog for his appearance on the Grist List's 15 Green Business Founders last month. Muchas Gracias!